Aanstadt Das Deerskin Breeches White Prolux- Full Seat with Sleeveless White V Neck Tee and White Stock Tie-All Sizes Available. Aanstadt das full seat made of white prolox(see description below) with a white deerskin leather full seat and one tone on tone white deerskin star. You may have up to three tone on tone stars on the full seat. 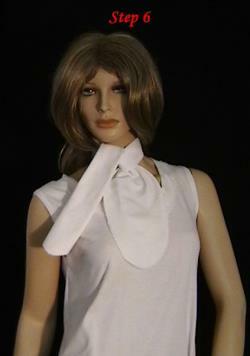 In this special we will be including a 100% cotton white v neck tee with a white prolux stock tie (see picture). The stock tie is what we call the 'super simple stock tie' it is a piece of material (usually same material as the pant) that is 36" long and 6" wide. Step 1 you start by laying the material flat step 2- you begin by folding the material into thirds (as shown in photo). Step 3- fold it over as seen in the next photo into a ribbon look shape one end longer than the other and wrap around your neck. Step 4- then you bring the long side up through as if you are tieing a knot. Step 5-take the piece you pulled through and lap over. Step 6- tighten at throat and spread open the top, fan it out and put your stock pin in. 6 easy steps and you now have a stock tie the full seats are also available in white powerlux. You can also request a dressage patch instead of a full seat-if interested in a dressage patch please inquire. Prolux is a standard 3 season fabric. One of aanstadt das's finest fabrics. It was introduced in 2000 as an alternative to french terry. Sonya worked with a mill to develop a fabric that was of a fine denier, 12% lycra with nylon, with the weight of french terry and soft on the inside. People have preferred prolux over the french terry because it is stronger and keeps it's color. The french terry has a tendency to loose it's color and get droopy over time. Our promax and prolux, as it is worn, will get a soft brushed matte look on the outside and keep it's shape. Over the years the fabric has gotten even better and we simply call it prolux. The fabric has a stretch of up to 140%, which is why it is a favorite amongst aanstadt das customers. When ordering one may like to take a size down due to the stretch. This fabric is truly 'a hug from the divine'. 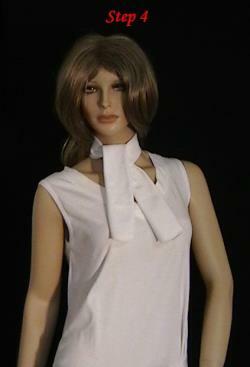 Special- white full seat, white sleevless v neck tee & stock tie-all for $115.00 great deal.